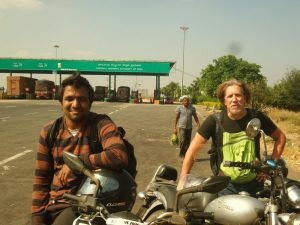 The time is flying by as we make plans and schedule for our ride to the Himalayas. Nihanth and I have been talking to potential sponsors for the web TV series for travel and riding gear, lodging and other things. So if the documentary comes off well, then perhaps we’l get some support with the weekly travel log series. Our planning sessions have been intense. Our items list is massive — including travel equipment like saddle bags, fuel containers, extra oil, tire repair, portable lights, medical kit, zero weather clothing — and it’s been tedious putting it together let alone gathering it all up. As a production company First Drum Films had to do a production budget, so we incorporated it under various categories like — production & travel, camera and travel gear, motorcycle equipment, schedules, and story-boarding. It’s been overwhelming how much we’re getting done. To help organize our efforts we created our travel and motor gear list much in the same way we created our film budget. We created spreadsheets broken down into Production, and Travel, Motor. All had subgroups. We listed the items, descriptions, cost, source, dates to buy or order everything, and totaled it all on a master page by category. This gives us a very clear view of costs and a checklist to follow. Without it a rider could forget semi-essential things (for a ride into that cold a climate) like moisturizer and sun screen, for example. Here is some of my thoughts interwoven with visuals of where we’re headed. Here is our initial route plans. If you’d like us to explore history, culture, or cuisine (or some other interest you have ) and include it in the first episode please leave a comment in the community (on Facebook or Google+). You can also engage with me on Twitter and Instagram. TRAVEL ROUTE: Bangalore –> Delhi –> Chandigarh (+260 kms)–> Manali (+330 Kms) –> Tandi (+130 Kms)–> Sarchu (+140 Kms) –> Leh (+280 Kms) –> Khardung La –> Nubra Valley. On the return we’ll shift west out of Delhi through Rajasthan through Mumai, down the coast to Goa and then back across to Bangalore. The total trip will be approx. 5,200 kilometers. Seems to be a great experience. Wonderful to watch. Good luck for your future journeys!